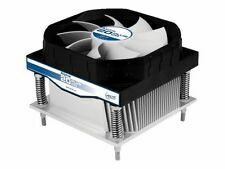 Great Air Flow: The PWM function automatically adjusts fan speeds according to the CPU temperature for efficient cooling and minimized fan noise. It allows for dynamic speed adjustment between 800 rpm to 2, 500 rpm. Supports Intel 115X CPU Socket: Comes up with an improved Intel CPU Block. This includes the comfortable Easy-Mount-System. After initial installation, the cooler can be mounted or dismounted tool-free at any time without the need to dismount the motherboard as well. Addressable RGB LED Fan: Addressable RGB function with motherboard sync-control for vivid lighting effect. Thermal Detection Sensor: CPU temperature monitored by a sensor and temperature change displayed through color lighting effects . It has untouched thermal paste which was applied in the factory. CPU Socket Type: LGA 1155/ 1156/ 1150. Material: Aluminum. Connector: 4pin. Rated Current: 0.41A. Trending at $7.47eBay determines this price through a machine learned model of the product's sale prices within the last 90 days. CPU Socket Type: LGA 1155/ 1156/ 1150. Heatsink: Material: Aluminum. Fan: Speed: 1200 - 2500Â RPM. Product Information Connector: 4pin. Amp : Varies (Which ever is available). Function: Yes. Directions: 4 PWM. Thermaltake CLP0556. ‣ Keyboard / Mouse. ‣ Monitor Mounts. Aluminum Extrusion. OutletPC was founded in 2001 and since then we've been focused on getting people around the world great deals on computer products, systems, and hardware. 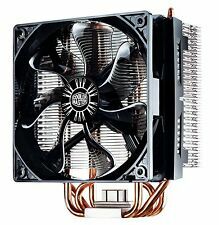 This CPU Cooling Heatsink has 7 fan blades, and provides strong cooling capacity. Five color LED fan fin assembly designed, superb cooling performance. Aluminum Fin permutations and combinations of science, with enhanced air duct system, cooling performance is more superior. The Hyper 212 EVO cooling systems are designed and optimized to provide the best user experience and cooling potential for a new generation of processors. This acts as a virtual vapor chamber that dissipates a large amount of heat. AMD Ryzen™ 5 1400. AMD Ryzen™ 3 1300X. AMD Ryzen™ 3 1200. AMD AM3 / AM3 / AM2 / FM2 / FM2 / FM1 socket. 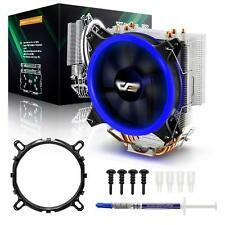 This CPU Cooling Heatsink has 7 fan blades, and provides strong cooling capacity. Note: When use in AMD socket, no require extra bracket, and is directly attached to the motherboard. It has untouched thermal paste which was applied in the factory. CPU Socket Type: LGA 1155/ 1156/ 1150 / 1151. Material: Aluminum. Connector: 4pin. Rated Current: 0.41A. Double heat pipe fin assembly designed, superb cooling performance. Fin permutations and combinations of science, with enhanced air duct system, cooling performance is more superior. 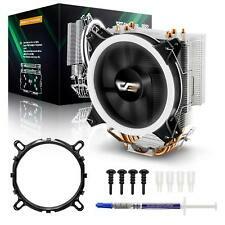 90mm fan, the outer and inner quiet move to achieve the perfect combination of performance and silent. 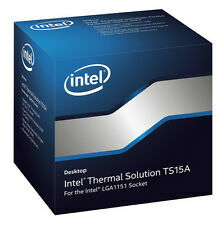 ONLY FIT FOR CPU Socket Type: LGA 1155/ 1156/ 1150 / 1151. Heatsink Material: Aluminum. Fan: Speed: 1200 - 2500Â RPM. Function: Yes. Directions: 4 PWM. 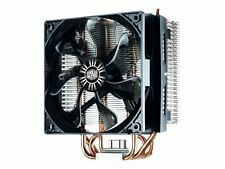 GENUINE ADAPTEC ALUMINUM COPPER HEAT SINK COOLING FAN. 1 (ONE) ADAPTEC ALUMINUM COPPER HEAT SINK WITH COOLING FAN. 70 x 70 x 15 mm Fan. 4-Pin Fan Connector. Aluminum Alloy/Copper Base. Speed: 4200 RPM. 1 xHeatsink With 4 Heatpipes & 120MM LED Fan. 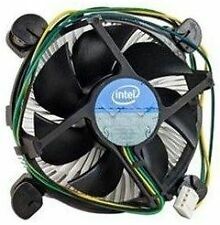 CPU fan speed: 1000-2000±100RPM. High-Density Aluminum Fins with solid copper heat pipes are designed for rapid heat dissipation, improving the cooling performance during operation. Item is working pulled and cleaned,in excellent condition. Fan Speed 2500RPM ± 10%. AMD AM3 / AM3 / AM2 / FM2 / FM2 / FM1 socket. 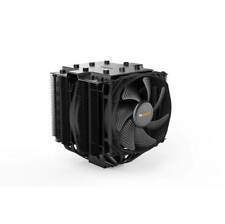 90mm fan, the outer and inner quiet move to achieve the perfect combination of performance and silent. 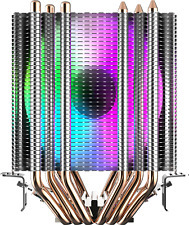 Type CPU Cooler. 1 x CPU Heatsink. 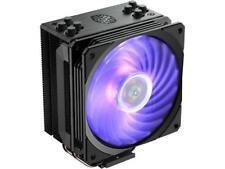 Cooler Master HYPER 212 EVO Rr-212e-20pk-r2 CPU With 120mm PWM Cooling Fan. Condition is New. Shipped with USPS Priority Mail. Trending at $17.33eBay determines this price through a machine learned model of the product's sale prices within the last 90 days. 6100 / 6100 (E). 6100 Silent /. 6100 Silent (E). 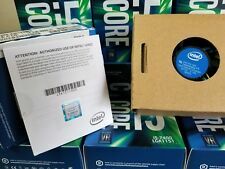 LGA1366 (i7). 6100 Light /. 6100 Light (E). 6100 PWM /. 6100 PWM (E). Material: Copper,Aluminum. Fan speed:2200RPM±10%. Rate Current:0.18±0.02Amp. B rand new. USA, Canada, United Kingdom, Austrilia, France, Germany, Spain, Ireland, Italy, Others. Canada, United Kingdom, Austrilia, France, Germany, Spain, Ireland, Italy, Others. We used the processors for custom orders that require a 3rd party heat sink.